About 10 million Americans gained insurance coverage in 2014 alone, thanks to the benefits of the Affordable Care Act (Obamacare). 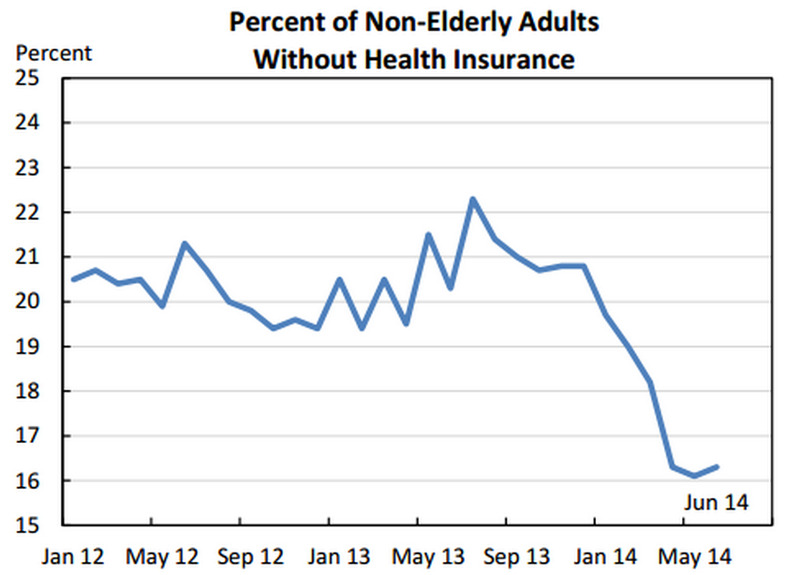 The graphic on the right shows how President Obama’s public health reform impacted the percentage of non-elderly Americans (18 to 64 years old) with no health insurance: in the summer of 2013 they peaked at more than 22%, just before steeply declining to just 16% in May this year. 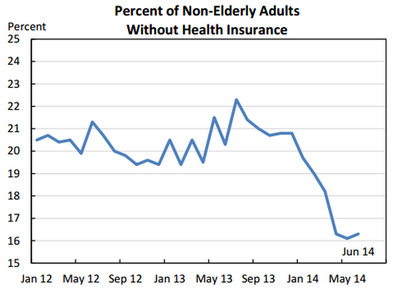 The number declined by almost 5 percentage points between January and June this year alone. The Financial Times quoted a paper from the president of the White House’s Council of Economic Advisors, Jason Furman, who claims the decrease as one of the biggest legacies of the Obama administration. Open enrolment is the period in which people can apply for a plan under the new act. The next window to apply opens between Nov. 15 and Feb. 15 next year, and will allocate plans for the whole 2015. A decision from the Supreme Court in June 2012 allowed singular States to opt out of the expansion of Obamacare, bringing huge differences between those parts of the country that expanded their coverage allowance and those that didn’t. In States like California, New York and Illinois, which adopted the expansion of Obamacare, the decline of uninsured people was about 6 percentage points in the first 6 months of this year, compared with only 3.1 percentage points in states that opted out, like Texas, Florida and North Carolina.